Rediff.com » News » Sheena Bora Trial: What's wrong with Peter? He is, at the closing of 2018, a man quite different from the Peter Mukerjea who entered judicial custody three-and-a-half years ago. He is a man not yet convicted of a crime, but already suffering for it, like the hundreds that enter these courts every day and the thousands Peter shares jail space with in a central Mumbai prison. 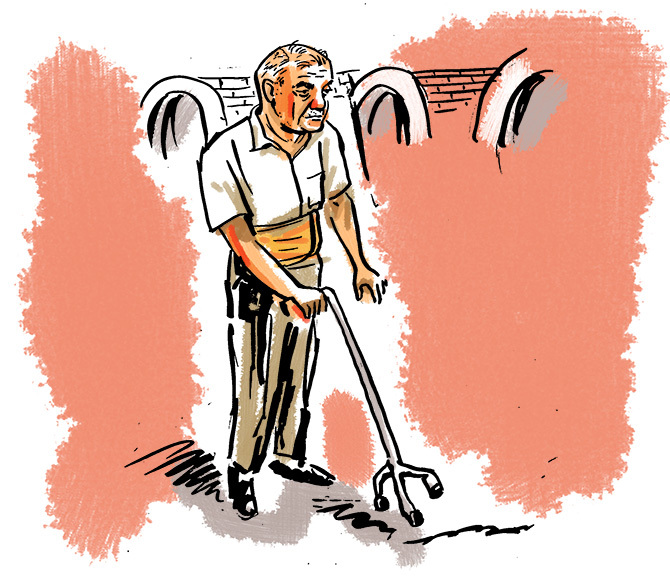 Peter Mukerjea, 64, came to court Tuesday, December 4, using an orthopaedic cane. A broad Velcro back support belt was strapped around his waist. 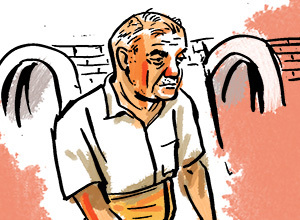 Accused No 4 in the Sheena Bora murder case, Peter has developed a back problem in jail. The lack of availability of a bed for him at the Arthur Road Jail, near Jacob Circle, central Mumbai, where he is being held in judicial custody, has either caused the ailment. Or aggravated it further. His repeated requests to the jail authorities, which he mentioned to CBI Special Judge Jayendra Chandrasen Jagdale, for a bed, so every morning he does not have to lift himself off from his mattress on the floor and bring further strain to his back, have not been heard. That nearly none of the approximately 3,000 undertrials at the Arthur Road Jail, built in 1926 that has a capacity for 800, have access to a bed is not considered particularly unusual at all. The prosecution argued that there was absolutely no need to oblige this particular request of Peter's, well because "there were many things not available in jails" for prisoners or undertrials and that facilities were such that even inmates suffering cancer did not get better privileges. That Indian jails are obnoxiously crowded we know. But that that is reason not to even hear or consider an undertrial's special human needs was hard to process. And would not have come to light if it wasn't someone as high profile as Peter Mukerjea voicing a need. Cars and beds dominated the hearing at Courtroom 51 at the Mumbai city civil and sessions court, Kala Ghoda, south Mumbai, on Tuesday. Does Peter Mukerjea need a bed in jail? Why are Indian prisoners in jail not worthy of beds? Didn't the Indian government just recently tell the British government that the Arthur Road Jail offered prisoners a bed, chair and table? Wouldn't a bed, chair and table be waiting for Vijay Mallya should he be extradited to India (a hearing for whom, ironically, was occurring at a court across the courtyard)? But the same jail did not/could not provide Peter a bed? Did he have a table and chair either? These were some of the questions raised at the December 4 hearing in the Sheena Bora murder trial, post the deposition of evidence by its 23rd witness. Kedar Krishna Kankonkar, 40, a used car salesman, was a blink-and-you-might-miss-him kind of witness in this case. He was also one of those witnesses whose scanty, not earth-shaking testimony did not seem particularly important to the progress of the trial and you wondered why he was brought to court by the prosecution to testify. The manager of the Shree Auto Plaza, Gamdevi, south Mumbai, Kankonkar in July 2012 had helped negotiate two deals -- the purchase of a 5-seater, 4-door Chevrolet Optra, bearing the licence plate MH-01 MA 2605 by his company and its sale to Car Station, Koparkhairane, Navi Mumbai, who eventually sold it to a man named Laxmibhai Chavan. The significance of this vehicle? This metallic grey Optra was the same car in which Sheena Bora was murdered on the evening of April 24, 2012 at a yet unnamed lane in Bandra, north west Mumbai, allegedly by her mother Indrani Mukerjea, by Sanjeev Khanna, Indrani's former husband, and by Shyamvar Pinturam Rai, the family driver. The Optra had its own history. It did not belong to the Mukerjeas and was owned by car dealer A M Motors, located opposite the Four Seasons hotel in Worli, south central Mumbai. AM Motors owner Faisal Nisad Ahmed had lent the car to the Mukerjeas. Three months after the killing, AM Motors sold the car to Kankonkar's firm for Rs 80,000 (at Ahmed's testimony a different price was stated), paid for in cash. Shree Auto Plaza, which is owned by a Mehboob Tharani, sold the car to the Navi Mumbai dealership for Rs 90,000, in a deal also paid for in cash (perhaps to avoid tax). Kankonkar managed that sale and coordinated the registration of the transfer at the various RTOs in Navi Mumbai and Mumbai city. Is the car still in existence? Will the present owner of the car depose in court? Is the car an exhibit in this case? Or is the car untraceable? Was Kankonkar's deposition important for the prosecution because the car had not been tracked down? Why did Kankonkar tell the court he worked for Shree Auto Plaza when his company is actually named Auto Palace? Why was his name spelled wrong on the earlier records? The bespectacled, confidently-speaking Kankonkar, who was wearing a tan shirt with blue jeans and a belt and two gold rings on his right hand, and lives in Girgaum, south Mumbai, gave his evidence to the court over about five to 10 minutes, guided by CBI Special Prosecutor Bharat B Badami. Badami spoke to him in Marathi. The defence lawyers took another ten minutes or less to examine him. Peter and Sanjeev's advocates did not cross-question him. But Gunjan Mangla, wearing a black and white kurta and representing Indrani, asked a few questions of Kankonkar, who replied in English. How long had he been working at Shree Auto Plaza/Auto Palace? Who owned the car dealership? How many cars had they ever bought from AM Motors? Did Kankonkar physically check the car before purchasing it from AM Motors? What kind of transactions were involved? Which police station had called him for questioning? Kankonkar, who had spent 10 years working as a manager at Shree Auto Plaza/Auto Palace, selling roughly 30 cars a year, and who knew Faisal Ahmed of AM Motors and said his owner "must be knowing" Ahmed too, offered: "Mere nazar mein ek hi gaadi khareeda tha (According to my knowledge we bought just one car from AM Motors)." He said the Santa Cruz police station, north west Mumbai, had called him for questioning. He also admitted to not having physically inspected the car before purchasing, although he handled the sale. That question about not checking the car perhaps caught Kankonkar unawares, as he deflected it. Mangla repeated and rephrased her question a few times. The judge intervened at one point to say that witness was capable and would no doubt answer her question. Before finishing up with Kankonkar, Mangla asked about the original transfer documents of the car and why instead copies had been filed. Badami commented at that point warmly to Mangla: "She has handled (the cross examination) well." After Kankonkar had stepped down from the stand, Badami got up to announce to Judge Jagdale that the next witness, Siddharth Das, Sheena Bora's father and Indrani's first partner, was having financial difficulties in coming to Mumbai. Apparently, and astonishingly, a witness is expected to make his own arrangements for travel and stay if subpoenaed to come for a court hearing, for which he is reimbursed later by the CBI. Judge Jagdale, who now has a new computer monitor in front of him (its empty box is stacked up behind him): "Who has to make the arrangements? The prosecution? What is the propriety for asking the court?" Badami mumbled that he was just mentioning this matter. Judge Jagdale cracked a joke, his eyes merry: "You are saying as if I should make arrangements!" December 14 was picked as the date for the next hearing, although the judge gently suggested to Badami that there should be "day to day hearings." By then it was expected that the CBI could make the necessary preparations to have Siddharth Das brought in from Kolkata. This piece of information was of interest in the accused box behind as both Peter and Indrani, wearing red and white and an elaborate red and white bindi (she is the queen of pretty bindis), craned to hear the interchange between Badami and the judge. One wondered if Peter had ever set eyes on Siddharth and when was the last time Indrani had come face to face with him. Shrikant Shivade, Peter's lawyer, approached Judge Jagdale about the status of various applications that had been made on Peter's behalf that were pending in court -- permission to apply for a renewal of his UK passport, his bail application and the request for a bed in his cell. The jail medical authorities in answer to Peter's application for a bed had suggested he move to a hospital and said because of overcrowding in the jail they could not afford him a bed. The Arthur Road Jail administrators told Peter they could only do it on the say so of the judge. A lengthy, strange, discussion started up over the possibility of a bed for Peter, with his concerned, baffled sister, Shangon Das Gupta listening in carefully. Badami said the jail doctors had to follow their rules and regulations. Peter, shuffling along on a walking stick, headed to the witness stand. He said because he didn't have a bed and he had a back problem he was finding it difficult getting up from the floor. The former CEO of Star India, during whose tenure programmes like Kaun Banega Crorepati and Kyunki Saas Bhi Kabhi Bahu Thi made Star TV one of the highest-earning channels, said he needed a bed only for the night. Peter said having a bed was not essential for him during the daytime and if there was a space issue they could take it away every morning. The exchange about a bed for a prisoner started getting gradually exceedingly more bizarre that you felt as far from reality as one of the soaps that had once aired on the channels Peter ran. Except more startling was that this was reality. This was real life. A4 (Peter) told the court that he had also determined that the bed would not take any more space than his mattress. But whenever he brought up his request to the jail doctors he was told he could go to the hospital attached to the jail. "I am not sick. I just have a back problem." Badami, agitatedly, countered both Shivade and Peter, saying there were many people in the jail who were enduring much worse and didn't have beds. "There are people suffering from cancer." Shivade gave Badami a long stare, his eyes grim. Peter murmured: "Thankfully I don't have cancer." After a ten-minute verbal detour to discuss the application for renewal of Peter's passport, to which the prosecution had not replied since July, The Bed Debate resumed. Shivade: "They want to shift him into the hospital. He only requires a bed at night. They are saying because of overcrowding (they cannot give him a bed)." Judge Jagdale, who makes routine visits to jails, said with a considered look, smiling kindly: "He has sufficient place (for a bed). Another in that (space) has had that facility." He was perhaps making a veiled reference to Nationalist Congress Party politician Chhagan Bhujbal, who was once housed in Barrack 12, where Peter has a cell. Shivade brought up the point that the Indian authorities told the British government that they had provisions for beds, chairs and tables for undertrials, but they did not have that for Peter. Badami exploded: "You should not discuss that!" Badami: "You should not mix up the issues." Shivade: "They are saying because of overcrowding he cannot have a bed. That is your fault. The State has miserably failed its citizens. Not giving them basic human rights!" Badami angry: "I know who is sitting in the AC in the jail! Why are you bringing up (Vijay) Mallya?" Shivade said something to the effect that anyone in jail should have beds not just his client and those were basic rights. Judge Jagdale: "We have to be considerate of his (Peter’s) age also." Badami again referred to the prisoner, afflicted with breast cancer, who had not received any special facilities. "So many things she didn't get. We should not discuss human rights violations." He also said that Peter had no medical reason for needing a bed. Shivade disagreed saying there was all the more reason to discuss it. At that point Indrani, who had been sitting in the benches just behind, since after the hearing, popped forward to remind Badami that she had been given medical grounds for getting a bed. Badami: "I am not 'oppositing' you. Tell your lawyer!" Indrani gurgled with laugher: "Oppositing?! Opposing," and thanked him sweetly. Peter again reiterated: "I am not asking for additional space." Instead of giving him a bed. he said they gave him a cane, which he was using. But a bed was what he really needed because it was difficult to pull himself up off his cell floor every day. The discussion did not have a conclusive ending. But Judge Jagdale seemed to have assured Peter that he would look into the matter. Peter left the court hobbling awkwardly on his new cane towards the prison buses. He is, at the closing of 2018, a man quite different from the Peter Mukerjea who entered judicial custody three-and-a-half years ago. His sister Shangon stood faithfully at the door downstairs seeing him off. Similar thoughts must have crossed her mind. One can only imagine her sadness. And the pain of the thousands of relatives, who stand, at that very spot, day after day, bidding their undertrial relatives goodbye.